London: H. Sawbridge, B. Tooke and T. Sawbridge, 1684. Hardcover. Very Good-. Frontis of King Charles II + fine engraved Titlepage with views of London, York, Lincoln & etc. by W. Sherwin. 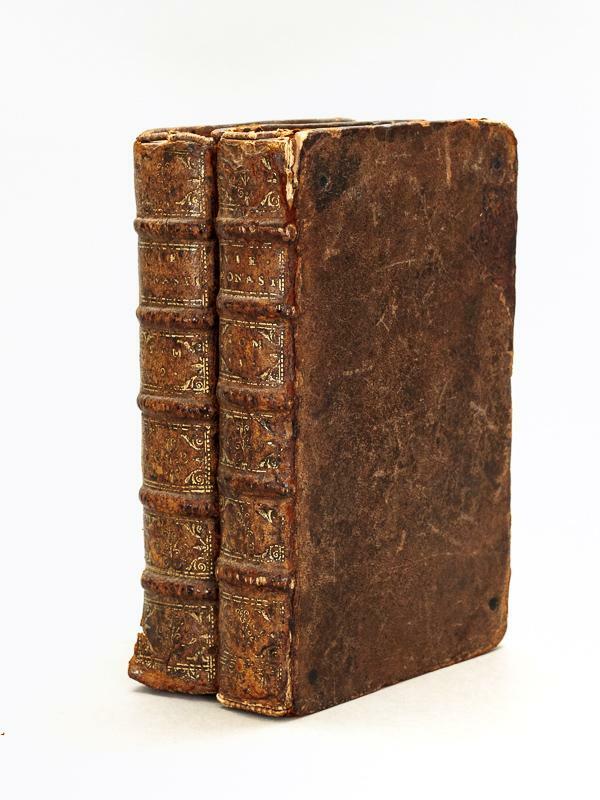 Folio gilt and blind-stamped double panelled calf, recent neat reback in matching leather with original gilt spine label from fine early-19th century binding set in. All Edges brightly Gilt. Frontis + engraved titlepage + printed titlepage +pp (Epistle to the Reader, Cataloque of Writers, list of Kings, Nobility) +p blank +750pp +pp index +pp blank. Collated complete A6+b2-k2+B4-Tt4+Aaa-Mmmmm4. Engraved Frontis and Title long ago underlaid onto matching paper, circular Library blind stamps to lower corner of 7 preliminary pages (other ownership marks of earlier provenance are noted below). 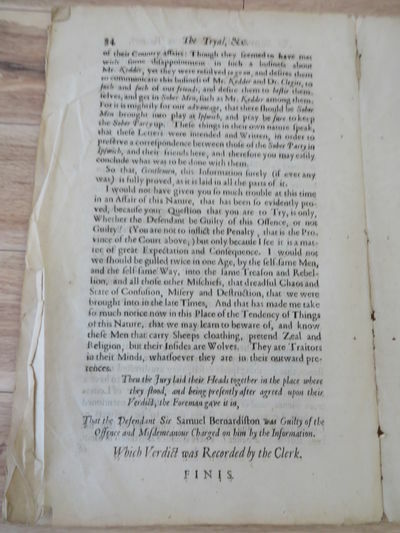 Top corners of first few pages browned, outer margin at end of index has brown stain not touching print, pale foxing to some other pages, but paper strong, clean and supple throughout. *Successive owners are indicated by: 18th century signature "Thom. W. Bruce" at titlepage top; fine gilt decorated red leather label "Mrs. Buckmaster 1831" on pastedown; ink note on free endpaper "C.J.B. from his uncle R.N.B. 1892"; and Wigan Library label dated 1934 on back of Title, recording Mrs. E.J. Buckmater's gift in memory of her husband Rev. Charles John Buckmaster (1850-1925). These later notes lead back to 1831 bookplate owner's probable identity: Joanna Harriet (1792-1865), widow of John Buckmaster (d.1820) who came from a slave-owning family in Jamaica. The 1892 inscription is probably from their son, the Rev. Robert Buckmaster (born 1819) to his nephew C.J. Buckmaster, whose widow presented this book to Wigan Library in 1934.
sumptibus Joh. Georg. Cottae, typis Martini Rommeii, 1684. Cm. 16,5, pp. (10) 1491 (77). Con una tavola genealogica ripieg. f.t. Frontespizio in rosso e nero. Bella legatura coeva in piena perg. rigida con unghie e titoli ms. al dorso; tagli colorati. Bell'esemplare. Jacob Wilhelm Imhof (1651-1728), scrittore e storico tedesco, fu autore di fortunate opere d'interesse genealogico (dedicate anche ad Italia e Spagna). Quest'imponente lavoro raccoglie preziose informazioni sulla storia degli elettori, delle abbazie e dei principati sottoposti alla giurisdizione imperiale. Un'esauriente studio di politica, genealogia ed araldica sulle principali famiglie del Sacro Romano Impero. Raro. Verosimilmente edizione originale. Cfr. per edizioni successive, Graesse III, 412; Kvk; non in Brunet..
London: Richard Chiswell. London, Richard Chiswell, 1684. First Thus.First Impression. Hardback. First edition translated by Gilbert Burnet (often quoted as preferable to Ralph Robinson's). One of the most important taproot texts for modern speculative fiction and a milestone in the genre's history. 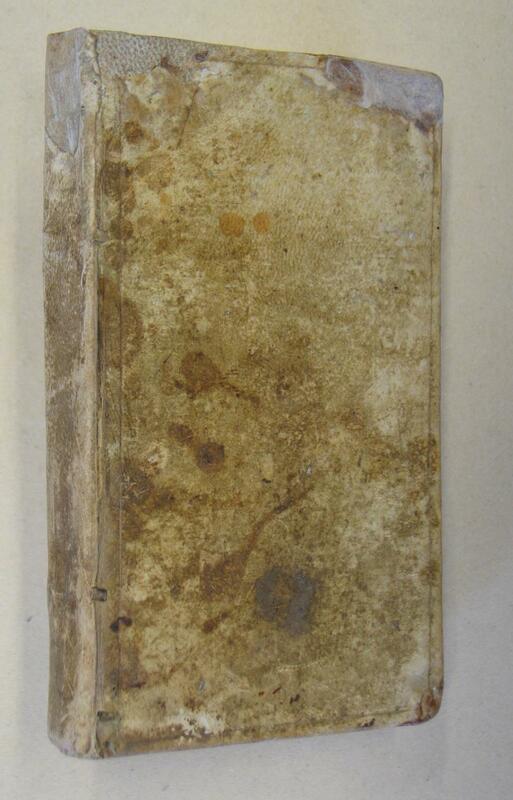 A lovely recent binding, marred by loss from every leaf that has been expertly repaired but still pretty obvious. A little spotted. A rare edition. Pagination: , 206. First leaf is a blank, followed by the title page and then the prologue. Our previous copy had to blanks before the title page, though the collation on this copy seems correct. Utopia is one of the most important works to have influenced the field of speculative fiction. In the 500 years since its publication, there have been hundreds of imitators, and the field would be a very different landscape without it. [6441, Hyraxia Books]. . Good. Hardback. 1st Thus Edition. 1684. Barbara Helena Kopsch, née Lang, was a member of the Pegnesischer Blumenorden (the Pegnitz Flower Society). One of the very few Baroque literary societies to admit women, it is (perhaps not coincidentally?) the only one that still exists today. Founded in Nürnberg in 1644 by Georg Philipp Harsdörfer, Johann Klaj, and Sigmund Betelius (later "von Birken"), on the model of the Fruchtbringenden Gesellschaft, the society, whose Arcadia was the banks of the river Pegnitz (which flows through Nürnberg), cultivated witty pastoral verse, "marked by linguistic play, including onomatopoiea, assonance, and internal rhyme" (Watanabe-O'Kelly). The members, who called themselves Pegnitz Shepherds (Pegnitz Schäfer or Hirten) took erudite Greek names of flowers; Lang-Kopsch's was Erone (Helenium). She was admitted into the Society in 1679, at the age of 23. The Pegnesischer Blumenorden website (!) records that she was the 68th member to join, and that she married Nicolaus Kopsch two years after publishing this collection, and moved to Berlin. In the Pegnitz Festschrift of 1744, Johann Herdegen (Amarantes) described her as a highly competent linguist who was also skilled in the arts: "she wrote German and French verse, and also translated from Latin in French; she also knew how to draw and paint and cut images and scripts in iIvory and alabaster" ("schrieb deutsche und französische Verse. Übersetzte auch aus dem Lateinischen ins Französische, konnte zeichnen, malen, Bilder und Schriften aus Elfenbein und Alabaster schneiden") . The laudatory poems are signed by Myrtillus (Martin Limburger, who succeeded Sigmund von Birken as Director in 1681) and Celadon (Christof Adam Negelein). Three other copies are recorded, at the Herzog August Bibliothek, the University of Munich, and UNC Chapel Hill. VD1732:692606M (HAB only). Not in Dunnhaupt, Faber du Faur, Goedeke, Jantz, Landwehr, Praz, Thieme Becker, or Hayn-Gotendorf. Cf. Watanabe-O'Kelly, Cambridge History of German Literature, p. 122; and Sigmund von Birken, Floridans Amaranten-Garte (Tübingen 2009), part 2, p. 915. 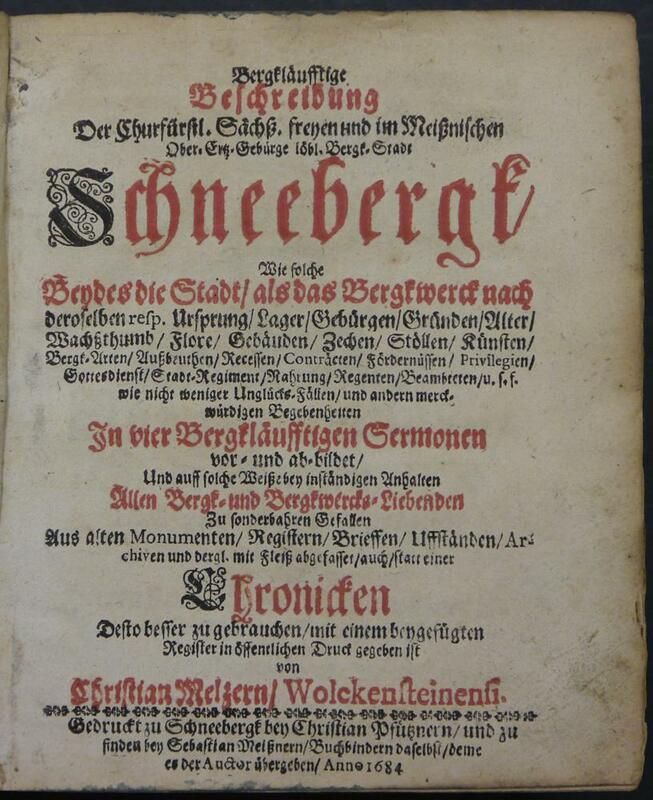 Fredro: First German edition of a popular work on political economy, first published in Latin in Danzig 1664. Fredro was a Polish noble who earned respect for his service as military commander of the Podolian Voivodeship; his several historical works earned him a reputation as the Polish Tacitus." 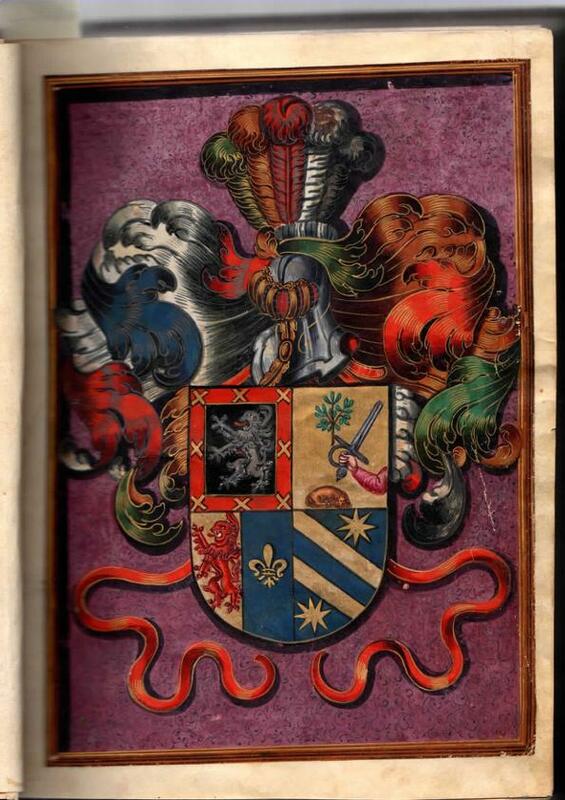 This copy contains an errata leaf not recorded by VD-17 (which locates 3 copies in Germany). VD1739:136566G. A remarkable survival: twelve original and highly finished drawings of falcons and hawks on their perches, with instructions on coloring and rendering, in preparation for creating a Japanese folding screen (byobu e). We have never encountered such a collection of drawings for a folding screen, revealing a Kano school artist at work. Because of the close association over the centuries to the shogun and aristocrats, Kano School artists had access to the government's mews where the falcons resided (bakufu taka beya). The sport of falconry has had a long history in Japan, beginning in the 4th century. With the succession of Yoshimune Tokugawa (1684-1751), in 1716, the sport of falconry became highly fashionable, an expensive and prestigious activity. It became one of the primary outlets for the militaristic energies of the samurai class during the long period of peace. With this new prestige, many paintings and screens featuring falcons and hawks were commissioned. This scroll contains 12 panels of highly finished preliminary paintings by a very accomplished artist - a member of the Kano School - for a yet unidentified screen. Each panel features a falcon or hawk on its perch. Many of the birds are rendered fully drawn and colored using highly skilled and intricate brush techniques, with notes by the artist on what colors to use for the perches, decorative braids, and background. Some of the colors include gold, pale peach, green, yellow, etc. The plumage of other birds are not fully colored and the artist has left very explicit and complicated notes about what coloring is required, how to execute certain effects by using certain kinds of white powder or paste, etc. Each perch has an elaborately knotted kumihimo, a braid to leash the falcon to its perch. Again, the artist has left elaborate instructions on how to color these braids, clearly intending them to be highly ornamental and beautiful. Background fabrics are depicted with embroidery or elaborate motifs, some already colored in green wash in several shades and some with instructions for coloring. 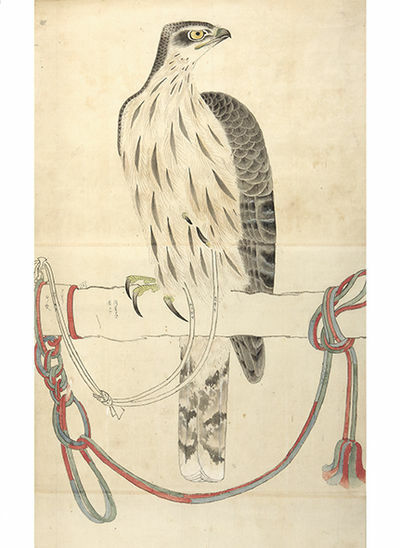 The old label on the outside of the scroll states: "Twelve images of falcons for the screen painting (byobu e), an heirloom of the Kano Family. Old Images." The Kano Family School, the longest lived and most influential school of painting in Japanese history, existed from the 15th century into modern times. It was a hereditary assemblage of professional, secular painters with a broad range of painting styles, pictorial themes, and formats. Animals were a favorite theme of the School and the various artists painted many screens and doors. We have not yet identified the screen for which these preliminary drawings were executed - we leave it to the next owner to solve that mystery. Frankfurt, Haaß für Zunner, 1684. - oder gründliche Beschreibung derjenigen Sachen, so in der Tieffe der Erden wachsen, als aller Ertzen der königlichen und gemeinen Metallen, auch fürnehmster Mineralien. Mit gestochenem Frontispiz, 41 teilweise ganzseitigen Textholzschnitten, 7 Blatt, 220 Seiten, 123 Seiten, 2 Blatt, 68 Seiten, Pergamentband der Zeit, 24 x 20 cm, Ein Blatt mit hinterlegtem Randeinriss, am Ende einige weiße Blatt zusätzlich eingebunden, gut erhaltenes Exemplar. Zweite Ausgabe der erweiterten Fassung unter dem neuen Titel "Aula". LANA de TERZI, Francesco (1631-1687). Magisterium Naturae, et Artis. Opus Physico-Mathematicum. 3 volumes. 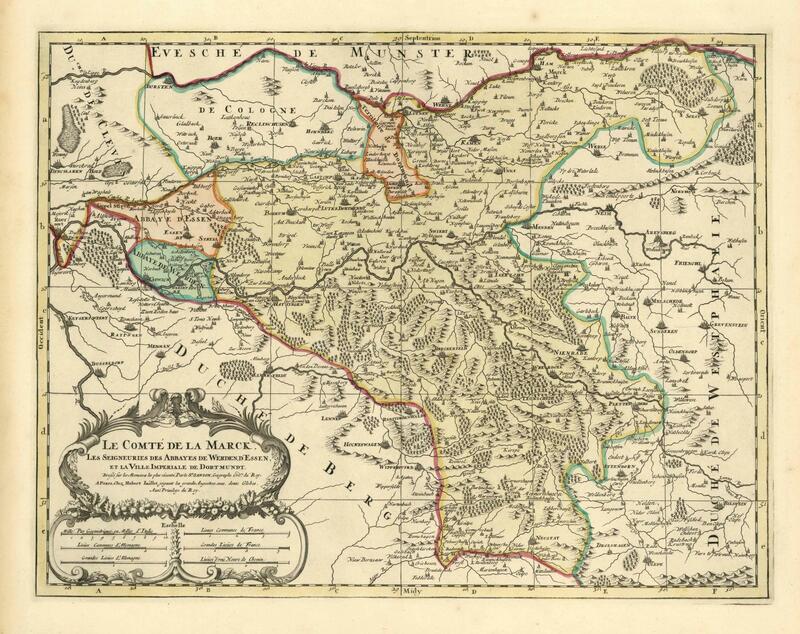 Brescia:: J. M. Ricciardi, 1684-86 [Vols. I & II]; Parma: H. Rosati, 1692 [Vol. 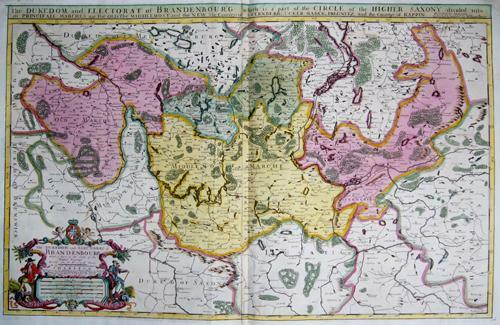 III]., 1684. 3 volumes. Folio. [xii], 526; [xxxiv], 512, ; [viii], 571 pp. 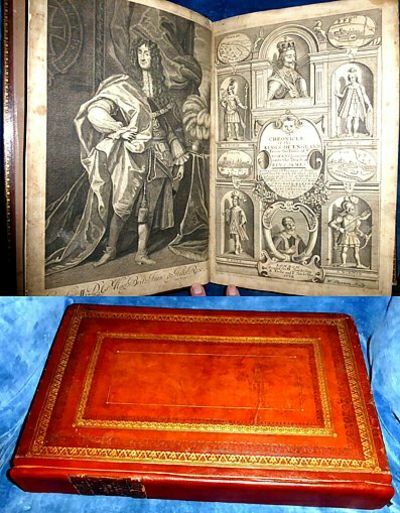 24 + 20 + 13 fine engraved plates [57 total* ], numerous woodcut initial letters, head & tail pieces. Original full vellum. Ownership signature of Hieronymous Bannia[!?]. Fine. EXTREMELY RARE. "QUESTA IMPORTANTISSIMA OPERA" - RICCARDI. 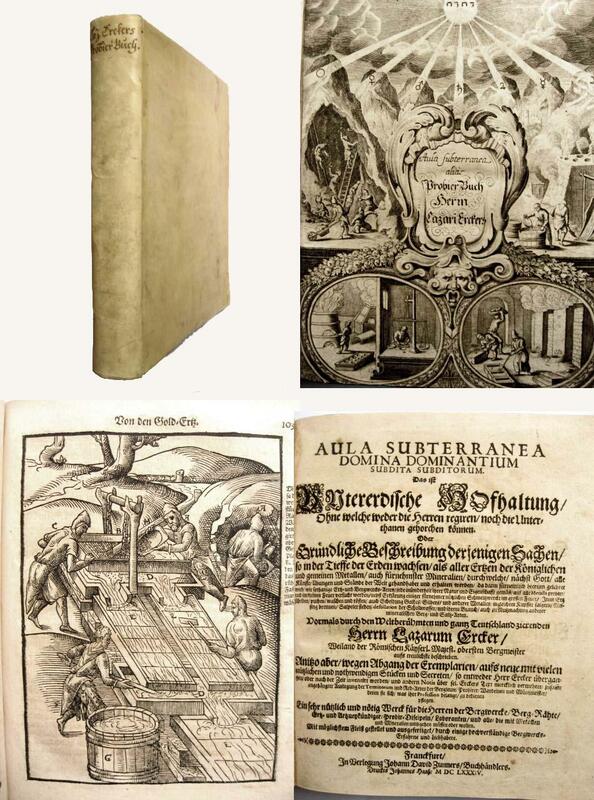 A monumental encyclopedia of physics written to complement Lana's Prodromo, 1670, by more thoroughly explaining the various theories advanced within. 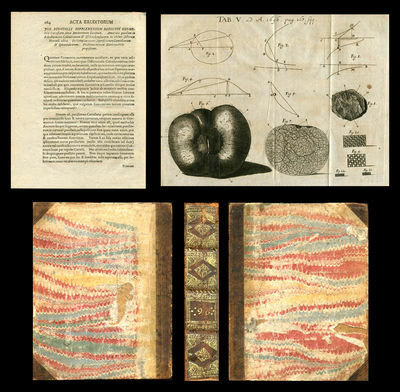 Sotheby & Willkinson stated, in their catalogue of the Guglielmo Libri Library, that one "would require an explanatory volume to give an idea of this work, which is truly a cyclopedia of all sciences connected with natural philosophy." Thorndike has written the most thorough account of the importance and content of this remarkable work. 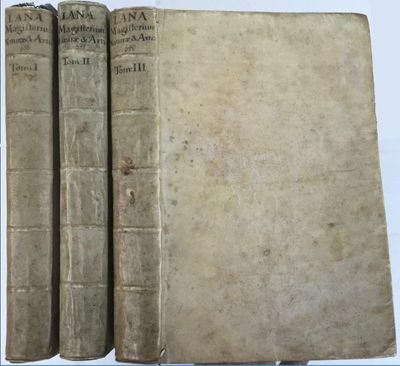 "Fourteen years went by before Lana Terzi began to issue the Mastery of Nature and Art, to which the Prodromo was to have been the portico, and its publication in three huge double-columned folio volumes extended over eight years. The long Latin title emphasizes the more occult principles of natural philosophy, experimentation and demonstration, 'almost all the inventions of the ancients and many new ones thought out by the author himself.' The second and third volumes in twenty-five books discuss as many varieties of motions of natural bodies, manifest and occult: namely, 1, the penetration of corpuscles through pores; 2, the motion of transportation through the pores of the body or concerning the effluvia of bodies; 3, the motion of the internal parts of any body; 4, liquefaction and concretion or coagulation, where are treated fluidity and consistency; 5, compression and pressure of bodies; 6, elasticity; 7, tension; 8, rarefaction and condensation; 9, tremor of bodies; 10, sound; 11, adherence of parts and resistance to discontinuity; 12, mixture, ready or difficult; 13, configuration or site; 14, assimilation; 15, excitation and fermentation; 16, maturation and crudescence; 17, corruption and putrefaction; 18, coagulation (again? ), where, too, of concretion (again?) properly called and incrassation; 19, precipitation; 20, dissolution; 21, fixation and volatilization, alkali and acid; 22, electric attraction (as by amber); 23, magnetic movements; 24, sympathy and antipathy; 25, gravity and levity. - Lynn Thorndike, History of Magic & Experimental Science, vols. VII, pp. 610-13, 693-94; vol. VIII, pp. 223, 230. / Thorndike also assesses the arrangement of the work, its propositions, experiments, and inventions, the artificia, in order to give the impression that mathematical as well as experimental method is being employed. Among the specific artificial magic, the author examines the pores, subtle liquors, making artificial gems, "altering less precious stones to diamonds, changing red coral to white, and sticking a needle into one's arm or leg without feeling any pain." Distillation, elasticity, and wine are all treated. "Chemical recipes such as 'our antimonial panacea' and the preparation of aurum fulminans are frequent." / The three large volumes contain descriptions of perpetual motion machines, the pendulum, problems of motion and percussion, hydraulics, elasticity, alchemical and chemical experiments, distillation, machines, the vacuum, sound and acoustics, electricity and magnetism, meteorological instruments, etc., etc., etc. / The attractive plates depict numerous experiments and scientific instruments. / *Riccardi, II, 13- "questa importantissima opera, che può considerarsi come una estesa enciclopedia fisico-meccanica." / "Book xxii ... treats at great length of motion due to electric attraction and repulsion; Book xxiii., the same for magnetic attraction; magnetic clocks, p. 409; sympathetic compasses, p. 412; the compass and the dipping needle, Book xxiii., p. 227." - Wheeler Gift 197. / "While in Rome Schott had helped instruct Lana, who completed his theology at the Collegio Romano in the early fifties, when Kircher started to arrange the museum and Paolo Casati held the chair of mathematics there. Lana did not fail to profit from so favorable a conjunction of luminaries. He studied independently with Kircher, and, with fellow student Daniel Bartoli, assisted in the experiments of Casati. He mastered natural philosophy, but without great satisfaction, for he found his branches to be differently, even contradictorily, treated. At the conclusion of his studies, if his later testimony be credited, he decided to try to establish a complete and consistent approach to the subject, firmly based on experiment." - Heilbron, p. 189. REFERENCES: Brunet III, 822-823; Riccardi I(ii) 13.3; Thorndike VII, pp. 610-13; Wheeler Gift 197. See: J.L. Heilbron, Electricity in the 17th and 18th Centuries: A Study of Early Modern Physics, University of California Press, 1979. Le Comté De La Marck, Les Seigneuries Des Abbayes De Werden, D'Essen, Et La Ville Imperiale De Dortmundt. Dreßé sur les Memoires les plus recents, Parle Sr. Sanson, Geographe Ordre. du Roy, A Paris, Chez Hubert Iaillot, joignant les grands Augustins, aux deux Globes. Avec Privilege du Roy.':. - Altkolorierter Kupferstich v. Nicolas Sanson b. Alexis-Hubert Jaillot in Paris, v. 1684, 44 x 57,5 Past., Jaillot, 1B. - Zeigt die Grafschaft Mark mit der Abtei Essen und Werden dem Stadtgebiet von Dortmund sowie dem Ruhrgebiet. - Unten links Titelkartusche mit Meilenzeiger. - Erster Zustand noch vor der Datierung! Armas, ynfançonia e ynformaciones de las casas solariegas de Estevan, Oliber, Coscollano y Claberol Despachada en la ciudad de Zaragoza el 21 de julio de 1653 a pedimento de Agustin Estevan; descendiente de estas casas solariegas. 1653-1684. . - . . . 1 Vol. . 103 folios pp. Folio Menor. . . Soporte pergamino. Encuadernado en plena piel gofrada de estilo neoplateresco. Interesante y copioso manuscrito sobre pergamino, que contiene las informaciones genealógicas, de nobleza y probanza de infanzonía de las casas de Estevan, Oliber, Coscollano, Claberol, Díaz, Infante, Gómez, Carpio, originarios del Reino de Aragón, Navarra, Álava, Béarn , Castilla y Portugal. 24 líneas de caligrafía humanística por cada página, con el texto recuadrado y adornado con letras capitulares de motivos antropomorfos y vegetales, todo ello a dos tintas. Contiene dos páginas iluminadas con los escudos familiares, a color y completados con diversos elementos ornamentales heráldicos. Asimismo el volumen recoge diversos expedientes administrativo-nobiliarios, con portadas propias decoradas con finas ilustraciones, sellos de placa y lacre, arboles genealógicos, etc. Buen ejemplo en su plenitud de la probanza nobiliaria española del siglo XVII. Encuadernado en plena piel con decoracion gofrada de ruedas y hierros de estilo neoplateresco. . The Dukedom and Electorat of Brandenbourg which is a part of the Circle of the Higher Saxony. Venetia: Presso Gian Giacomo Hertz, 1684. Published in 1585 at the direction of Pope Sixtus V and authored by his personal physician, this popular Italian herbal describes the properties and uses of medicinal herbs from Europe, the West Indies, and Asia and provides us with very detailed and often whimsical woodcut illustrations of salubrious plants. The present copy is from one of only a few early editions and is uncommon (OCLC locates eight copies, two of these in North America). In addition to being a botanist and a doctor, Castore Durante (ca. 1529-90) was a poet, and he wrote the Latin verses that appear as part of many descriptions. In the entry for the arbor tristis, for example, Durante compares the "melancholy tree" to a nymph, and the fanciful woodcut depicts a tree whose trunk is the body of a woman and whose limbs--with carefully detailed, oversized leaves--are her arms stretching up to the moon and stars above. Many of the woodcuts include a tiny human or animal, either tending or eating the plant, and a mere sprig of a fruit bush is shown as a full-grown tree in the midst of a landscape. These flights of imagination are the work of Leonardo Parasole, an Italian engraver and woodcutter, who took the name of his better-known wife, engraver and designer Isabella Parasole (sometimes mistakenly credited for the work here). 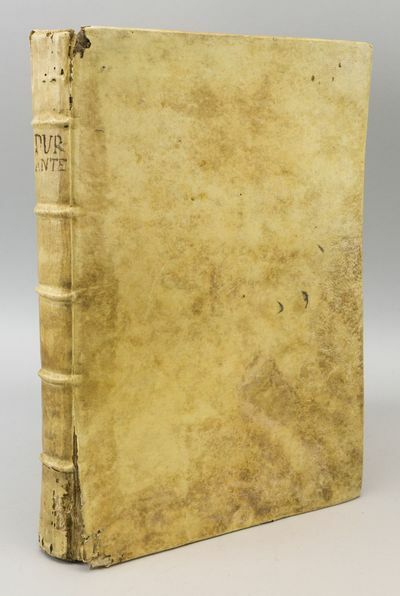 Durante, whose position as the doctor of the pope no doubt contributed to his authority and to the market for his works, wrote other family medical guides on hygiene and nutrition.. 335 x 230 mm. (13 1/4 x 9 1/4"). 6 p.l., 480 pp,  leaves. Original parchment over boards, inked title on spine. In a custom-made gilt-titled folding cloth box. Large and attractive woodcut device on title, decorative headpieces, tailpieces, and initials, and NEARLY 1,000 WOODCUTS OF PLANTS in text. Title printed in red and black. Spine and joints wormed and torn above top and below bottom cord, boards slightly splayed, a few other small tears and slight soil, but a sound and not unsatisfying contemporary binding. Minor worming in upper margin of first few gatherings, one signature somewhat browned, a little browning elsewhere, two leaves torn in lower blank margin, but generally excellent internally, with text usually clean and fresh. Published in 1585 at the direction of Pope Sixtus V and authored by his personal physician, this popular Italian herbal describes the properties and uses of medicinal herbs from Europe, the West Indies, and Asia and provides us with very detailed and often whimsical woodcut illustrations of salubrious plants. The present copy is from one of only a few early editions and is uncommon (OCLC locates eight copies, two of these in North America). In addition to being a botanist and a doctor, Castore Durante (ca. 1529-90) was a poet, and he wrote the Latin verses that appear as part of many descriptions. In the entry for the arbor tristis, for example, Durante compares the "melancholy tree" to a nymph, and the fanciful woodcut depicts a tree whose trunk is the body of a woman and whose limbs--with carefully detailed, oversized leaves--are her arms stretching up to the moon and stars above. Many of the woodcuts include a tiny human or animal, either tending or eating the plant, and a mere sprig of a fruit bush is shown as a full-grown tree in the midst of a landscape. These flights of imagination are the work of Leonardo Parasole, an Italian engraver and woodcutter, who took the name of his better-known wife, engraver and designer Isabella Parasole (sometimes mistakenly credited for the work here). Durante, whose position as the doctor of the pope no doubt contributed to his authority and to the market for his works, wrote other family medical guides on hygiene and nutrition. per Piero Matini, all'Insegna del Lion d'Oro, 1684. Cm. 24, pp. (8), 253 (1). Bellissima vignetta incisa in rame al frontespizio bicromo. Con 26 belle tavole calcografiche f.t. a piena pagina raffiguranti vermi e parassiti. Manca come sempre il ritratto dell"Autore inciso da Halluech su disegno del Sustermans (Piantanida, 1752: "questo ritratto manca quasi sempre"). Legatura ottocentesca in mezza pelle con titoli e filetti in oro al dorso. Carta marmorizzata ai piatti. Abrasione di carta marm. al piatto posteriore. Sporadiche e lievi fioriture. Esemplare ben conservato. 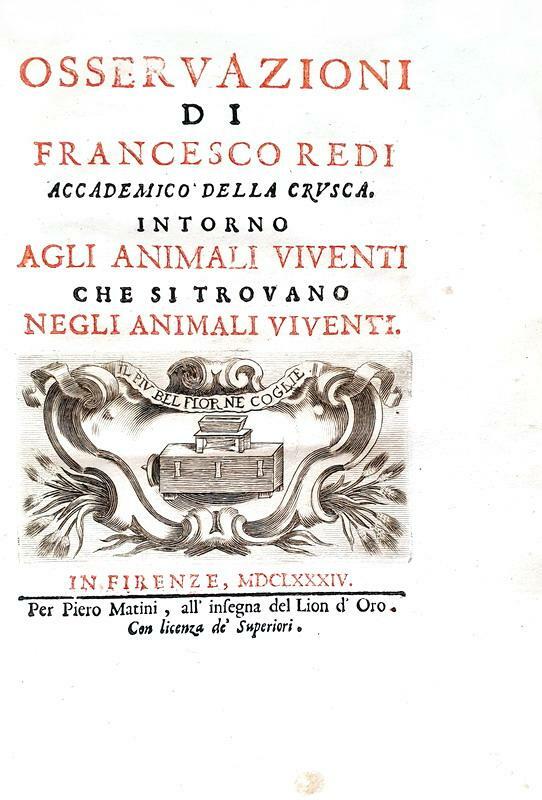 Francesco Redi (1626-1697), nativo di Arezzo, fu medico e tra i principali studiosi di scienze naturali d"Europa. Quest"opera fu tra i testi fondanti la moderna parassitologia. L"A. descrive con perizia scientifica 108 tipologie differenti di parassiti scoperti tramite dissezioni di numerose specie animali. Prima edizione. Si segnala l"esistenza di una seconda tiratura priva dell"errata. Così Piantanida: "Rara ediz. originale... Le tav. sono inc. con particolare finezza". Cfr. anche Brunet, IV, 1175; Graesse, VI, 58; Gamba, 823; Razzolini, p. 288. Garrison-Morton, 2448.1; Ceresoli, 446; Castiglioni, p. 475..
London: Benjamin Tooke, 1684. First Edition. Disbound. Fair. , 8, 13-34,  pp. Folio. Small library sticker to bottom of first page. Bottom third of first page missing. Last two pages loose (leaves are blank). Paper mainly clean, with a few minor spots. Edges a bit rough, with some creases and small chips to edges of last two pages. A trial for sedition connected with the Rye House Plot. 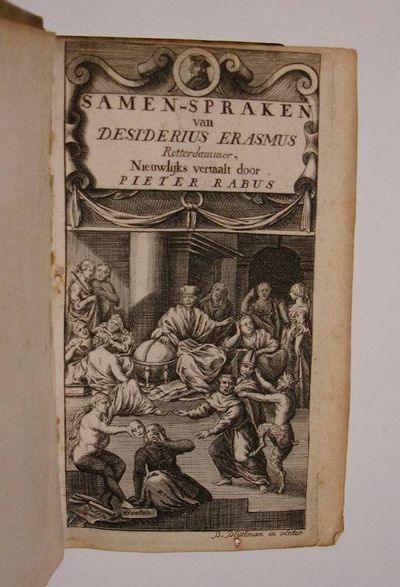 Samenspraken van Desiderius Erasmus, Rotterdammer. 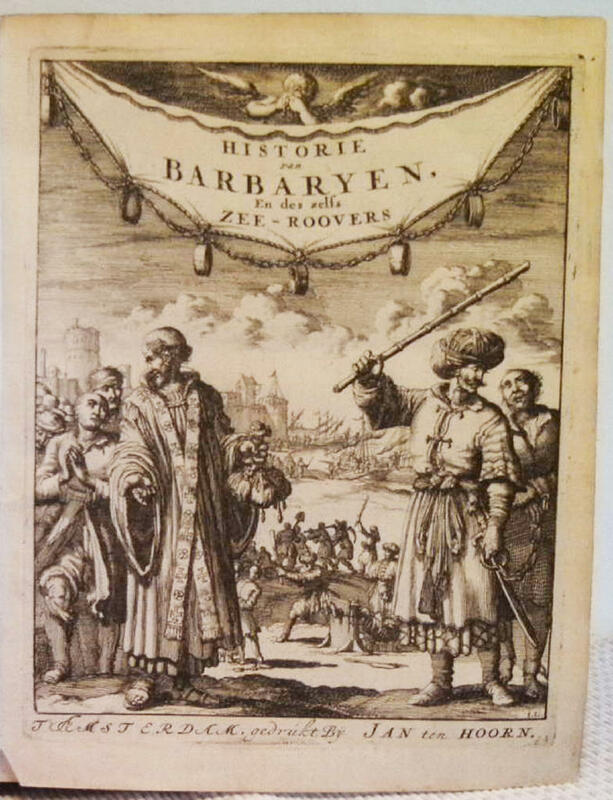 Nieuwelijks uit het Latijn vertaalt, met noodige aanteekeningen door Pieter Rabus. Hiervoor gaat, De Vermomde Hofjonker, uit Erasmus schriften berijmt. Met byvoegsel van een Samenspraak van Erasmus, die tot dezen tijd toe verduistert, en nu voor d'eerstemaal in 't Latijn gedrukt is, vertaalt door den zelven. Cours élémentaire de paléontologie et de géologie stratigraphiques.Paris, Victor Masson, 1849-1852. 2 text volumes (8vo) and 1 table volume (4to). With 628 mostly wood-engraved figures in text (except for 1 folding cross-section) and 17 numbered tables (16 folding). Volumes 1 and 2 in contemporary half morocco. Volume 3 (tables) in original printed paper wrappers with green cloth spine. DSB X, pp. 221-222; Ward 1684; D.A. Young, Geological evidence for the age of the earth, p. 109. 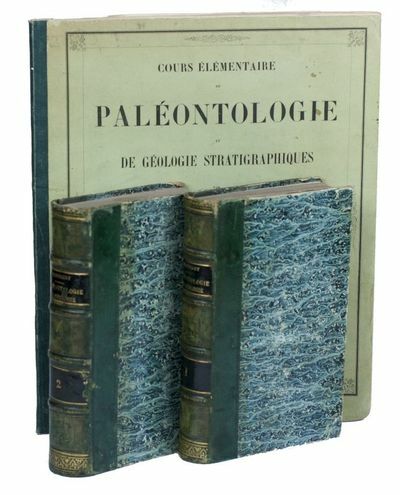 Complete first edition, including the tables (often lacking), of a standard work on stratigraphy and palaeontology by the famous Alcide d'Orbigny (1801-1857), "perhaps the most accomplished French paleontologist of the generation following Cuvier" (Young). In this work "he subdivided the Cretaceous System into 'stages', based on the notion that a typical fauna would be annihilated and replaced by a new fauna" (Young). He based his new classification of fossils on his research on geological strata, establishing the vital link between palaeontology and stratigraphic geology that has proved so fruitful for both disciplines. Many contemporary geologists opposed his stratigraphic ideas, but despite this controversy he was appointed professor of palaeontology at the Museum d'Histoire Naturelle in Paris in 1853. The work contains numerous wood-engraved illustrations by E. Salle, which show an enormous variety of plant and animal fossils, from tiny invertebrates to gigantic dinosaurs.In very good condition, with only some faint foxing on the first and last few pages. 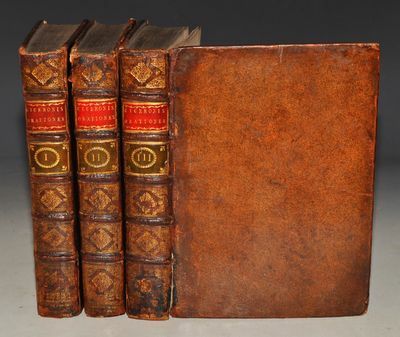 Bindings of the text volumes slightly rubbed along the extremities and worn along the corners; paper wrappers of the tables slightly soiled, but still in good condition. 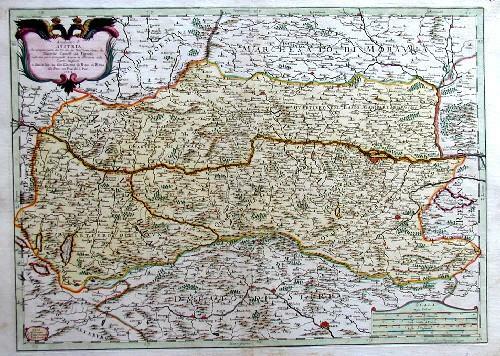 Artist: Rossi Giacomo Giovanni (d) ; date: (d)1684 - - technic: Copper print; - colorit: colored; - condition: Some restoration at lower centerfold; - size (in cm): 40 x 55; - description: Map shows total Austria; - vita of the artist: Giovanni Giacomo De' Rossi was the son of the founder of the most important and active printing press of the 17th century in Rome. Begun in 1633 by his father Giuseppe (1570-1639), the press passed firstly to Giacomo and to his brother Giandomenico (1619-1653), and then later to Lorenzo Filippo (1682-? ); in 1738 it became the Calcografia Camerale, from 1870 until 1945 the Regia Calcografica, and today it is known as the Calcografia Nazionale. Here are conserved, amongst many others, the plates of Giambattista Piranesi (1720-1778). Giacomo De' Rossi was the most involved of all the various family members who ran the press, and he worked between 1638 and 1691, and was to take the company to the height of its success. Renovirte und mercklich vermehrte alamodische Hobel-Banck, oder, lustig und sinn-reicher Discurs zweyer gereister Adels-Personen: Worinnen sie die groben Sitten, Ehr-Sucht, falsch-gemeynte Complementen, eingerissenen Mißbräuch in Gesellschafften, Bücher-lesen, Kinder-Zucht, Kleidern, etc. so heutiges Tages bey vielen. Teutschen in vollem Schwang gehen. Deme noch beygefügt ein kurtz-verfasster Grobianus, sambt einer kurtzen Anweisung für Junge und in die Frembd reisende Personen. O.O., Dr. u. J. (um 1670). Kl. 8°. 2 Bll., 198 S., Prgt. d. Zt. - VD17 1:642860Z (ca.1684) - Faber du Faur 788a - Goedeke III, 231,2 - Hayn-G. III, 287: "Selten !" .- Es fehlt das Frontispiz.- Sehr seltene und frühe Ausgabe mit dem Anhang "Nützliche Lehren des berühmten Sitten-Lehrers Catonis" (S. 188ff.). Typisches barockes Anstandsbuch für die gehobene bürgerliche Gesellschaft nebst Fragen zur Mode. "Critical sociological commentaries in dialogue form and advice for persons travelling in foreign parts. The book is not satire, as Goedeke states, but a ,Baedeker' for manners." (FdF).- Titel mit hs. Besitzvermerk, nur gering fleckig, letzten 5 Bll. mit Wurmgang, Ebd.-Kanten u. Ecken tls. etw. ergänzt. Wunder-voller Schauplatz der Heiligen Märtyrer, Und zwar vornehmlich Der um der Wahrheit und des Namens Christi willen auf allerley grausame Weise Getödteten Kinder, Von Unmündigen an, bis auf Fünffzehn-jährige, Nebst einem kurtzen Anhang von den Trübsalen und Verfolgungen der Gläubigen durch alle Secula N. Testaments (...) Von Friedrich Eberhard Collin. (56), 664, 183, (1) Seiten. Frakturdruck. OHNE den doppelseitigen Kupferstich. Rot-schwarzer Titel mit Druckermarke (Schiff mit Wind im Heck erreicht Hafen, unten Monogramm des Druckers) 8 (18 x 10,5 cm) Pergamentband der Zeit mit durchgezogenen Bünden und rotgefärbtem Schnitt. Friedrich Eberhard Collin (1684-1727) war ein pietistischer Hofprediger zu Lobenstein. Eine Verfasserbiographie beinhaltet sein posthum erschienenes Werk 'Der Sieg der ersten Blut-zeugen Jesu Christi (...)'. Collins, der als Kleinkind mit seinen Eltern aus dem von den Franzosen belagerten Geburtsort Worms fliehen musste, studierte in Gießen und Jena Theologie bevor er Prediger dreier Gemeinden bei Wertheim wurde. Dieses Amt übte er wohl mit besonderer Wachsamkeit gegenüber seinen 'Schäfchen' aus, führte er doch penibel Buch über deren Namen, Kinder, Besitz geistlicher Drucke, etc. (Zu seiner nicht immer einfachen Zeit in Wertheim, vgl. auch Ritschl II, 539). 1723 wurde er vom Dienst suspendiert, tauchte jedoch schon im Folgejahr wieder als Schuldirektor auf, bevor ihn, ein weiteres Jahr später, der Graf Heinrich XV. Reuß zu Lobenstein zu seinem Hofprediger machte. In seine Zeit als Schulleiter fällt auch die Entstehung des vorliegenden Werkes, dessen Widmung er im Mai 1725 unterzeichnet. - Collins Werk ist exemplarisch für die durch den Pietismus hervorgebrachte moralische Erbauungsliteratur der Frühaufklärung. Theologische Literatur, zumal solche, die der breiter werdenden Leserschaft säkularer Werke eine starke religiöse Orientierungen des moralischen Handelns entgegensetzt, dominiert weiterhin das Buchwesen und befriedigt einen mit dem Pietismus steigenden Bedarf. Der Märtyer-Schauplatz teilt darüber hinaus in seiner Thematik und theatralen Metaphorik auch Tropen des barocken Dramas. Das Theater, das sich im 17. Jahrhundert auch als Werkzeug der konfessionellen Identitätsstiftung und Propagandamittel etablierte, will nicht die Realität abbilden, sondern präsentiert eine ständehierarchisch strukturierte und heilsgeschichtlich perspektivierte Welt, konzipiert als Theatrum mundi. Dazu gehören wesentlich die Märtyrerfiguren als erbauliche Exempel. Die inszenierte Atrocitas dient hierin schon bei Andreas Gryphius und anderen Dichtern der Mäßigung und Affektkontrolle des Rezipienten. - Der drastische Kupferstich, der durch Soldaten an Kindern verübte Gräueltaten zeigt, FEHLT. Eine Kopie des Stiches liegt bei. - Pergamenteinband etwas angeschmutzt und an den Innendeckeln stellenweise etwas gelöst. Rücken mit schwindendem handschriftlichen Rückentitel entrundet und vom Buchblock gelöst, Schnabelbildung am Frontschnitt. Innengelenke etwas abgeplatzt, das erste und letzte Blatt jeweils teilweise gelöst. Papier bis auf wenige schwache Braunflecken oder unmerkliche Spuren nur marginal färbender Wasserflecken gut erhalten. Trotz aller Alterspuren ein solides Exemplar des inhaltlich bemerkenswerten und recht seltenen Werkes. Bergkläufftige Beschreibung Der Churfürstl. Sächß. freyen und im Meißnischen Ober-Ertz-Gebürge löbl. Bergk-Stadt Schneebergk, Wie solche Beydes die Stadt als das Bergkwerck nach deroselben resp. Ursprung, Lager, Gebürgen, Gründen, Alter, Wachßthumg, Flore, Gebäuden, Zechen, Stollen, Künsten . In vier Bergkläufftigen Sermonen vor- und ab-bildet, und auff solche Weiße bey inständigen Anhalten allen Bergk- und Bergkwercks-Liebenden . aus alten Monumenten, Registern, Brieffen, Uffständen, Archiven und dergl. mit Fleiß abgefasset. Orationes. Interpretatione & Notis illustravit P. Carolus de Merouville, Societatis Jesu, Jussu Christianissimi Regis, ad usum Serenissimi Delphini. Parisiis, Dionysium Thierry, Simonis Benard, 1684. Hardback, Tall 8vo. (10 x 7 inches). Early 19th. 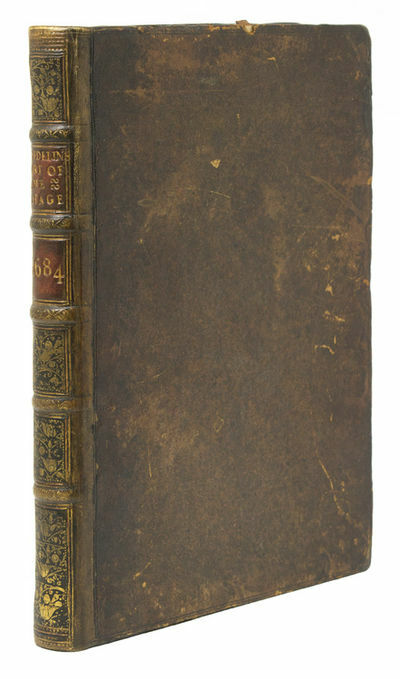 century brown full calf leather binding, raised bands, gilt decoration, red and green leather spine labels lettered in gilt. Plain endpapers and red speckled edges. In very good conditions. Rubbing to extremities. Bumps and chips to corners. Spines rubbed. Some darkening to endpapers, small tear to corner of endpaper in vol.1. Neat inscription "Thomas Moody, 314." to front. Minor stain to top corner of first few pages in vol.1. Some slight tanning to pages edges, some minor handling marks, else inside pages very clean and tight. Excellent copies for age. 590 + 595 + 683pp. Embellished with engraved vignettes and headpieces, also decorative engraved letterpieces at start of text. Cicero's Letters reflect the Roman society and are from great historical interest. Presso Gio: Giacomo Hertz, 1684. Cm.14, pp. (24) 606 (12). Antiporta figurata e fregio xilografico al frontespizio. Legatura coeva in piena pergamena rigida. Leggermente ondulate le carte, peraltro esemplare genuino e ben conservato. Edizione originale, piuttosto rara. Così si esprime il severo Cocognara (4370): "Professa l'autore d'essersi servito delle migliori Guide come lo Stringa, il Bardi, il Sansovino col Martignoni, e il Boschini L'opera non è infatti spregevole". Cfr. Anche Fossati-Bellani (2263) e Cicogna il quale attriguisce l'opera all'abate Ganassa. Autograph letter signed, to the Duchess of Aveiro. Agaña (Mariana Islands), 25 April 1684. Folio, 4 pp., manuscript in ink on paper, about 1500 words, written in a neat hand; in fine condition preserved in a bookform case by Sangorski and Sutcliffe. An exceptionally interesting manuscript, in which Father Solorzano, a Jesuit missionary in the Mariana Islands, gives news of the work accomplished by the Mariana Islands Mission, and discusses plans for the missionaries to explore and evangelise the southern continent. The plan is clearly reminiscent of Quiros' memorials about seventy years earlier.In the 1660s Spanish Jesuit missionaries set out to colonise the Mariana Islands, which until then had been called the Ladrones - named thus by Magellan for the thievery of the native inhabitants. Father Solorzano was one of the earliest casualties in what became a vicious struggle between the Spanish settlers and the native peoples of the islands: three months after the date of this letter he was killed in a skirmish and became one of the first martyrs. 'Meanwhile, Duchess Maria d'Aveiro, who had already more or less adopted the mission, saw to it that the necessary flow of ducats was continued from Madrid to the Marianas. She was repaid with abundant letters full of detailed information on the Church's progress in those regions. Her archives, which must have been a historian's goldmine, contained many manuscripts dealing with ecclesiastical and colonial affairs. In 1923, however, they were sold to Maggs Brothers and subsequently dispersed...' (Francis X. Hezel).This is one of that small series of letters written by Solorzano to the mission's patron the Duchess of Aveiro, sold by Maggs Brothers in their famous catalogue Australia and the South Seas of 1927. This specific letter was item 52 in the catalogue, which summarised the manuscript thus:'Father Solorzano tells how supplies for the Mariana Islands had been delayed by storms, but that the people of Manila had sent help to them under the command of Don Damian de Esplaña. The garrison had been away in the island of Rota, preparing the conquest of the island of Zaypan, and on its return voyage had nearly been lost in a great storm together with the governor and various friendly Indians, in all some three hundred persons.' "Added to this anxiety was another... which was that the bilander which was moored to the harbour with nine cables, broke away during the gale, and was finally smashed to pieces on the reefs off the shore, thereby destroying our hope of exploring the southern islands which lead to the unknown Austral lands and are the goal of our endeavours". 'The writer goes on to tell how they had tried to obtain other boats for the purpose of exploring the islands in the South, and that the Governor having died Esplaña had been nominated in his stead...'We have been unable to trace whether this proposed expedition ever set sail'. (Maggs, catalogue 491, item 52, £52 10s).As various publications of the period attest, the Spanish and especially the colonists in Mexico continued to see the proposals of Quiros for the evangelisation and annexation of the southern land as a real possibility. In 1669 for example, Father Luis de San Vitores' Memorial, printed in Mexico, renewed Quiros' call (and quoted from him extensively) to lobby for the consolidation of a mission in the Mariana Islands as a stepping-stone to the colonization and conversion of the "Southern or Austral Islands"
Die Reisen der wahren Gottseeligkeit auf Erden. Vom Anfange der Welt her bis auf den heutigen Tag, in einer anmuthigen Allegorie oder verblümten Rede, vormahls im Jahr 1683 (...) in Englischer Sprache beschrieben. Nun aber (...) ins Hochdeutsche übersetzet und zu gemeiner Erbauung im Christenthum herausgegeben von Christoph Matth. Seidel. 16. Mit gefalt. gestoch. Frontispiz. 10 Bl., 378 S., 3 Bl. Pgt. d. Zt. Erste Ausgabe. - Beigebunden: Ders. Die Reisen der Gottlosigkeit, welche (...) 1684 (...) in Englischer Sprache beschrieben, nun aber (...) übersetzet und (...) heraus gegeben hat Christoph Matthaeus Seidel. Halle, Waisenhaus, 1721. Mit gefalt. gestoch. Frontispiz. 10 Bl., 417 S. - Einzige Ausgabe. - Jöcher/Adelung III, 144. MacKenzie 1151 und 1152. - Gestempelt. Gutes, sauberes Exemplar. THE DECAMERON. The novels and tales of the renowned John Boccacio, the first refiner of Italian prose, containing a hundred curious novels. By seven honourable ladies and three noble gentlemen, framed in ten days. London, printed for Awnsham Churchill, at the Black Swan at Amen Corner, MDCLXXXIV. . FIFTH EDITION IN ENGLISH 1684. 4to, approximately 300 x 195 mm, 12 x 7½ inches, LACKS ORIGINAL PORTRAIT, FACSIMILE PORTRAIT ADDED. (The facsimile has the name of Boccacio missing underneath his portrait), decorated initials, divisional title page to the last five days: "The Decameron Containing an Hundred very pleasant Novels" with a dedication page to Sir Philip Herbert Kt. and To the Reader on verso, pages: , 208, 221-483, , text is continuous despite pagination, catchwords are correct, ornament consisting of two rows of six printer's devices on title page, rebound at sometime in half morocco with cloth sides, gilt title to spine, gilt rules between leather and cloth, new endpapers, top edge gilt, OLD INK SIGNATURE OF ELIZABETH HAWKSMOOR TO TITLE PAGE, probably that of the only daughter of the architect Nicholas Hawksmoor. Pale age-browning throughout, on a few pages the browning is heavy, but all text legible, spotting to margins, title page and last two pages have a small water stain to inner margin, vertical thin pale stain to title page and a small stain to outer edge, tips of corners missing to title page and following page, several pages have tiny closed tears to outer margin neatly repaired, a few other stains and small spots, a few pages have neat underlining, page 39 has a closed tear running into text, repaired, no loss to text, a good copy only. ESTC R2136. There are 2 variant printings, one with 12 flowers in two rows on title page the other with printer's devices in two rows, as ours. MORE IMAGES ATTACHED TO THIS LISTING, ALL ZOOMABLE, FURTHER IMAGES ON REQUEST. POSTAGE AT COST. 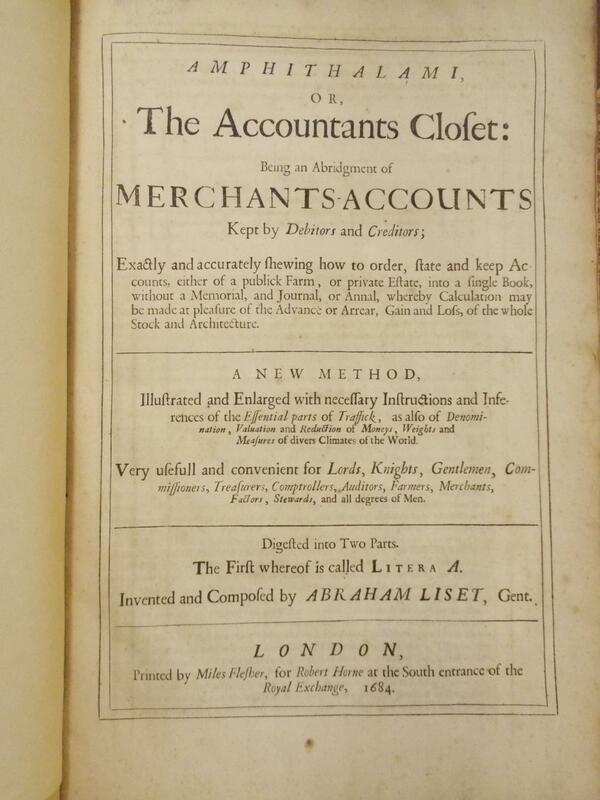 Printed for Richard Chiswell, London, 1684. First issue of the first Burnet edition. Hardcover. Good Condition/No Dust Jacket. Size: Octavo (standard book size). Text body is clean, and free from previous owner annotation, underlining and highlighting. Binding is sound. Original calf, , 206 pages. Written in Latin by Sir Thomas More, Chancellor of England. This is the second English translation of More's classic, translated by Bishop Gilbert Burnet. First issue of the first Burnet edition. Wear to leather, paper spine label, not period but early, hinges cracked, still attached, brief pencil notes about this volume on end papers. Quantity Available: 1. Shipped Weight: 1 lb 11 oz. Category: Antiquarian & Rare; Pictures of this item not already displayed here available upon request. 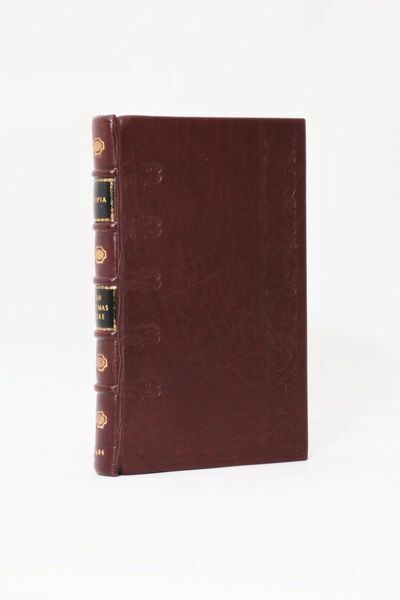 Inventory No: 012693. .
FIRST EDITION, FIRST PRINTING OF JOHANN BERNOULLI'S FAMOUS BRACHISTOCHRONE PROBLEM (sometimes called the Brachistochrone challenge). The Brachistochrone (Greek for 'shortest' and 'time) problem itself was one of the earliest examples of a class of problem now known as the calculus of variations. By the 19th century, thanks to Lagrange among others, all fundamental laws of nature could be formulated in terms of the calculus of variations - a kind of universal language of physics. Bernoulli issued his mathematical challenge in the context of the argument between Newton and Leibniz over who first invented the calculus, the mathematical study of change. While Newton, save for a small notice, made something of a secret of his discovery of fluxions, Leibniz had published his calculus in 1684. By 1695, he and his student, Johann Bernoulli, had developed the calculus into a magnificent tool for solving an array of problems. Bernoulli and Leibniz, however, were curious about how much Newton really knew. Together they devised a test, the Brachistochrone problem, confident that only a mathematician who knew the calculus could solve it. Following the custom of the time, they published it. The problem read as follows: "Let two points A and B be given in a vertical plane. To find the curve that a point M, moving on a path AMB , must follow such that, starting from A, it reaches B in the shortest time under its own gravity" (ibid). Johann added that this curve is not a straight line, but a curve well known to geometers. Wanting to lure Newton, Bernoulli introduced his challenge as follows: "I, Johann Bernoulli, address the most brilliant mathematicians in the world. Nothing is more attractive to intelligent people than an honest, challenging problem, whose possible solution will bestow fame and remain as a lasting monument. Following the example set by Pascal, Fermat, etc., I hope to gain the gratitude of the whole scientific community by placing before the finest mathematicians of our time a problem which will test their methods and the strength of their intellect. If someone communicates to me the solution of the proposed problem, I shall publicly declare him worthy of praise" (Bernoulli, Acta 1696, p. 264). The solution to the Brachistochrone problem was a segment of a cycloid and it was solved by Leibniz, Newton (absent a proof), von Tschirnhaus, l'Hôpital and both Bernoullis. "Among the solutions, the two by the Bernoulli brothers were of particular importance. Johann had ingeniously reformulated the challenge as a problem belonging to optics, i.e., the bending of a light ray through a transparent nonuniform media, and applied Fermat's principle of least time. He thus demonstrated the fundamental parallel between geometric optics and point mechanics, which would lead to the work of W.R. Hamilton in the 1830's. The solution by Jacob also contains a general principle, namely, that a curve which constitutes a maximum or minimum as a whole must also possess this property in the infinitesimal - the fundamental principle of the calculus of variations" (DSB). Two of the solutions would be of significant import: one, Johann's own, because it would present the first example of the optical-mechanical analogy, and his brother Jakob's because it represented an important early step in the calculus of variations in that he realized that the problem itself was of a new type, the variable being a function (upon which, not incidentally, Lagrangian mechanics is based). ALSO PRESENT ARE OTHER PAPERS OF SIGNIFICANCE: Four by Jakob Bernoulli: "Observatiuncula ad ea quaenupero mense novembri de Dimensionibus Curvarum leguntur" WITH "Constructio Generalis omnium Curvarum transcendentium ope simplicioris Tractoriae et Logarithmicae", WITH "Problema Beaunianum universalius conceptum", WITH "Complanatio Superficierum Conoidicarum et Sphaeroidicarum" AND two more by Johann Bernoulli "Demonstratio Analyticea et Syntetica fuae Constructionis Curvae Beaunianae" WITH "Tetragonismus universalis Figurarum Curvilinearum per Construitionem Geometricam continuo appropinquantem" AND two by Tschirnhaus "Intimatio singularis novaeque emendationis Artis Vitriariae" WITH "Responsio ad Observationes Dnn. Bernoulliorum, quae in Act. Erud. Mense Junio continentur" WITH "Additio ad Intimationem de emendatione artis vitriariae". CONDITION & DETAILS: Leipzig: Grosse & Gleditsch. Octavo (slightly trimmed by a conservator at the top margin; no loss whatsoever and if one didn't know it wouldn't be evident). , 604 [inclusive of errata], 2. 9 copperplates. The only institutional evidence is a small, unreadable stamp on the front flyleaf. 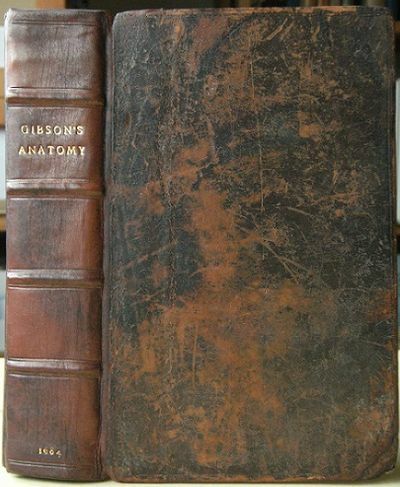 Tightly and solidly bound in half-calf over marbled paper boards; some of the calf at the spine chipped and has been professionally re-glued. The boards are scuffed and rubbed (see photo); internally, light toning; largely bright and very clean. Very good condition. London, printed for Awnsham Churchill, at the Black Swan at Amen Corner, MDCLXXXIV. .. FIFTH EDITION IN ENGLISH 1684. 4to, approximately 300 x 195 mm, 12 x 7½ inches, LACKS ORIGINAL PORTRAIT, FACSIMILE PORTRAIT ADDED. (The facsimile has the name of Boccacio missing underneath his portrait), decorated initials, divisional title page to the last five days: "The Decameron Containing an Hundred very pleasant Novels" with a dedication page to Sir Philip Herbert Kt. and To the Reader on verso, pages: , 208, 221-483, , text is continuous despite pagination, catchwords are correct, ornament consisting of two rows of six printers devices on title page, rebound at sometime in half morocco with cloth sides, gilt title to spine, gilt rules between leather and cloth, new endpapers, top edge gilt, OLD INK SIGNATURE OF ELIZABETH HAWKSMOOR TO TITLE PAGE, probably that of the only daughter of the architect Nicholas Hawksmoor. Pale age-browning throughout, on a few pages the browning is heavy, but all text legible, spotting to margins, title page and last two pages have a small water stain to inner margin, vertical thin pale stain to title page and a small stain to outer edge, tips of corners missing to title page and following page, several pages have tiny closed tears to outer margin neatly repaired, a few other stains and small spots, a few pages have neat underlining, page 39 has a closed tear running into text, repaired, no loss to text, a good copy only. ESTC R2136. There are 2 variant printings, one with 12 flowers in two rows on title page the other with printer's devices in two rows, as ours. MORE IMAGES ATTACHED TO THIS LISTING, ALL ZOOMABLE, FURTHER IMAGES ON REQUEST. POSTAGE AT COST. The Anatomy of Humane Bodies Epitomized Wherein All the Parts of Man's Body, with Their Actions and Uses, Are Succinctly Described, According to the Newest Doctrine of the Most Accurate and Learned Modern Anatomists. The Second edition. Angel & Crown, St Paul's Churchyard: J. Heptinstall, for Thomas Flesher, 1684. Second edition, small thick octavo, pp (14), 590, with the imprimatur leaf, some age-toning and thumbing throughout, a little light staining in places, 16 anatomical plates (of which one is small and folding, repaired at one of the folds), a small neat name and address dated 1954 on the front endpaper, contemporary mottled calf, a little worn, neatly and sympathetically rebacked by Temple Bookbinders. Still an attractive copy of a scarce work. [Thomas Gibson, MD, 1647-1722, was born at Bampton in Westmorland. He graduated doctor of medicine at Leyden, 20th August, 1675, and was admitted a Licentiate of the College of Physicians 26th June, 1676. He is stated in the Annals of the College of Physicians to have been created doctor of medicine by the archbishop of Canterbury, 16th May, 1663 (age 16), and to have been admitted ad eundem, at Cambridge, 5th October, 1671. He was admitted an Honorary Fellow of the College of Physicians 30th September, 1680. Because he was a presbyterian he was removed from the list of Fellows when the college received a new charter under James II in 1687'. He was reinstated after the Glorious Revolution in 1688 when William and Mary came to the throne. He was physician-general to the army 1718-19. His second wife, Elizabeth, was the sixth daughter of Richard Cromwell, briefly Lord Protector (1658-1659)), the son of Oliver Cromwell. His book Anatomy of Humane Bodies epitomized went through eight editions, between 1682-1737, the first being published anonymously. It was a best seller. It was based on a revision of Alexander Read's Manuall of Anatomy (1634), which Gibson acknowledges, and in English, instead of Latin which had been obligatory before censorship and permission from the Stationers Company disappeared during the civil war and interregnum. The beautiful illustrations are taken from Vesalius's anatomical drawings.]. Second edition. Full-Leather. Good. Amsterdam : Tartas. 1684. Hardcover. First edition. Later calf-backed marbled boards. 8vo, 108 pages, 18cm. In Hebrew. Vmograd, Amsterdam 521; Steinschneider 5327, 4; Zedner 165; Roest 252. 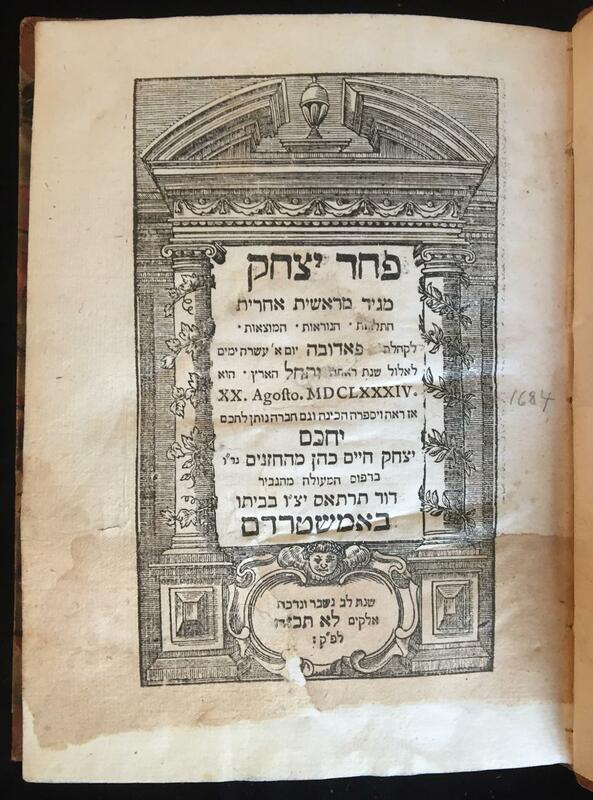 The author, known by the Hebrew acrostic of his name "YeCHKaM" (Yitzchak Chaim Kohen Min HaChazanim) , was one of the Paduan physician-poets who had some influence upon the young Moses Chaim Luzzatto (RaMCHa'L) . "Min HaChazanim" is the Hebrew equivalent of the Italian surname "Cantarini. " He was a Rabbi and physician of Padua, Italy, describes the attempt to storm the Ghetto in Padua, where Jews were accused of having sided with the Turkish enemy and murdered Christian prisoners-of-war in Budapest. Luckily the garrison commander of Padua was able to repel the attackers. 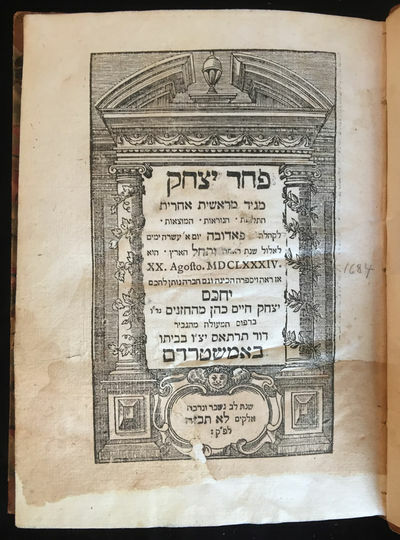 The engraving representing the binding of Isaac is an allusion to the name of the author, who fittingly called the story of his experiences in Padua, "Pachad Yitschak" (the fear of Isaac) . (See: M. H. Gans, Memorbook p. 143, where title and beautifully engraved frontispiece of the Binding of the Isaac are illustrated) . Also with a history of the community of Padua and the rabbis that served there. 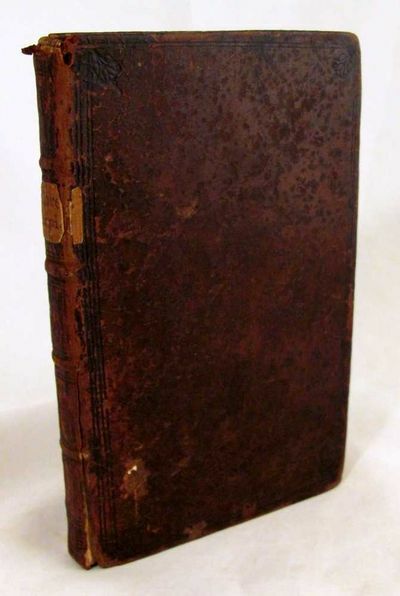  Previously owned by Lazarus Goldschmidt and includes his bookplate on front pastedown. Vinograd, Amsterdam 521. SUBJECTS: Jews -- Persecutions -- Italy -- Padua. Jews -- Persecutions. OCLC lists 9 copies worldwide. A copy sold at auction for over USD 1100 in 1995. Letterpress title with lower portion of title-page laid down, additional copy of title-page tipped in (with noticeable loss) , opening few leaves with marginal paper repairs. A beautiful copy nonetheless. Overall Very Good Condition. (HEB-48-58) . Santa Cruz de Marcenado, A.
Reflexiones militares del Mariscal de Campo Don Alvaro Navia Ossorio, Vizconde de Puerto, ò Marques de Santa Cruz de Marzenado (6 Bde.). Parte primera, Tom. 1: Libros I II y III parte primera, Tom. 3: Libro VIII parte segunda, Tom. 5, Libro XI parte segunda, Tom. 6: Libros XII y XIII parte segunda, Tom. 7, Libro XIV parte tercera, Tom 9, Libro XVII Alvaro de Navia Osorio de Santa Cruz de Marcenado (1684-1732). Amsterdam, Jan ten Hoorn, 1684. Inbunden bok. Pergamentband, 17x22 cm. (6), 488, (20) ; (8), 178, (10) ; 46 (s. 43-46 felpaginerade 33-36), (2) s. Graverad titelsida, 25 graverade planscher, varav 15 utv.-bara, de flesta graverade av Jan Luyken. Osservazioni intorno agli animali viventi che si trovano negli animali viventi.Firenze, per Piero Matini, all'Insegna del Lion d'Oro, 1684. 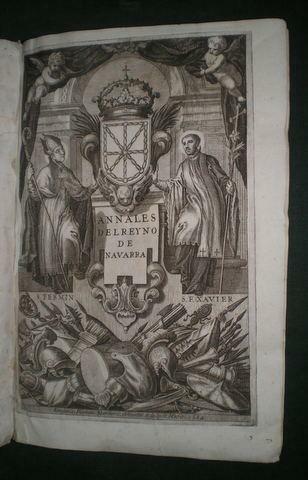 ANNALES DEL REYNO DE NAVARRA. Tomo I.
Martín Gregorio Zabala, Pamplona 1684 - Folio (30x21), frontis grab, port, 3h, 836p, 48p, rastro de polilla en márgenes (no afecta texto) en primeras 80 págs, algunas hojas tostadas. Pergamino. Amsterdam : Tartas, 1684. First edition. Later calf-backed marbled boards. 8vo, 108 pages, 18cm. In Hebrew. Vmograd, Amsterdam 521; Steinschneider 5327, 4; Zedner 165; Roest 252. The author, known by the Hebrew acrostic of his name "YeCHKaM" (Yitzchak Chaim Kohen Min HaChazanim) , was one of the Paduan physician-poets who had some influence upon the young Moses Chaim Luzzatto (RaMCHa'L) . "Min HaChazanim" is the Hebrew equivalent of the Italian surname "Cantarini. " He was a Rabbi and physician of Padua, Italy, describes the attempt to storm the Ghetto in Padua, where Jews were accused of having sided with the Turkish enemy and murdered Christian prisoners-of-war in Budapest. Luckily the garrison commander of Padua was able to repel the attackers. 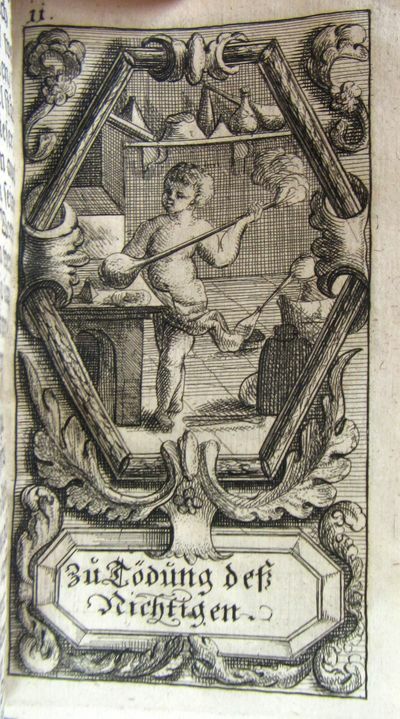 The engraving representing the binding of Isaac is an allusion to the name of the author, who fittingly called the story of his experiences in Padua, "Pachad Yitschak" (the fear of Isaac) . (See: M. H. Gans, Memorbook p. 143, where title and beautifully engraved frontispiece of the Binding of the Isaac are illustrated) . Also with a history of the community of Padua and the rabbis that served there.